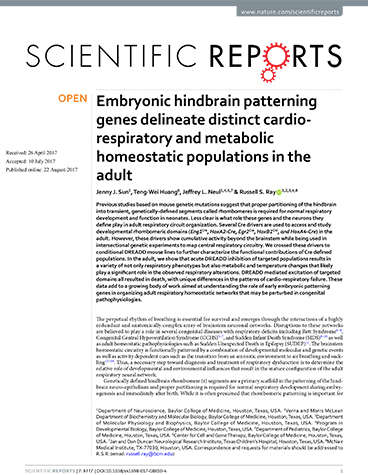 Embryonic hindbrain patterning genes delineate distinct cardio-respiratory and metabolic homeostatic populations in the adult. 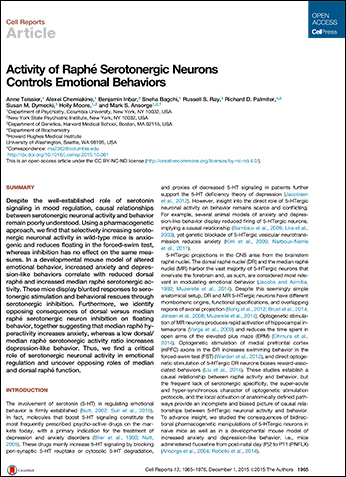 Tg(Th-Cre)FI172Gsat (Th-Cre) defines neurons that are required for full hypercapnic and hypoxic reflexes. Biol Open. 2017 Aug 15;6(8):1200-1208. doi: 10.1242/bio.026823. Yeh SY, Huang WH, Wang W, Ward CS, Chao ES, Wu Z, Tang B, Tang J, Sun JJ, Esther van der Heijden M, Gray PA, Xue M, Ray RS, Ren D, Zoghbi HY. 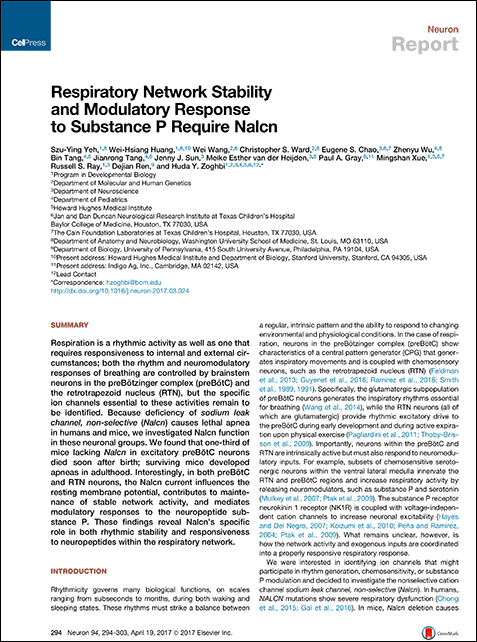 Respiratory Network Stability and Modulatory Response to Substance P Require Nalcn. Neuron. 2017 Apr 19;94(2):294-303.e4. doi: 10.1016/j.neuron.2017.03.024. 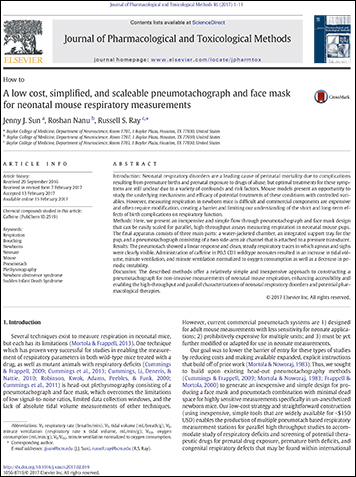 A low cost, simplified, and scaleable pneumotachograph and face mask for neonatal mouse respiratory measurements. J Pharmacol Toxicol Methods. 2017 Jul;86:1-11. doi: 10.1016/j.vascn.2017.02.019. 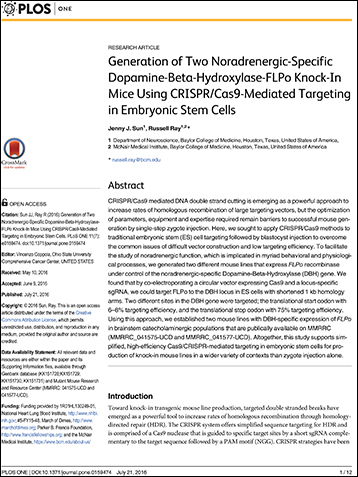 Generation of Two Noradrenergic-Specific Dopamine-Beta-Hydroxylase-FLPo Knock-In Mice Using CRISPR/Cas9-Mediated Targeting in Embryonic Stem Cells. Landstrom AP, Sun JJ, Ray RS, Wehrens XH. 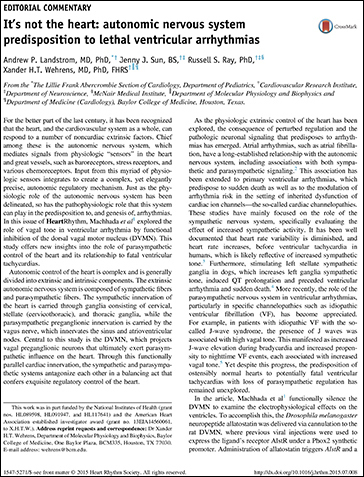 It’s not the heart: autonomic nervous system predisposition to lethal ventricular arrhythmias. Heart Rhythm. 2015 Nov;12(11):2294-5. doi: 10.1016/j.hrthm.2015.07.008. 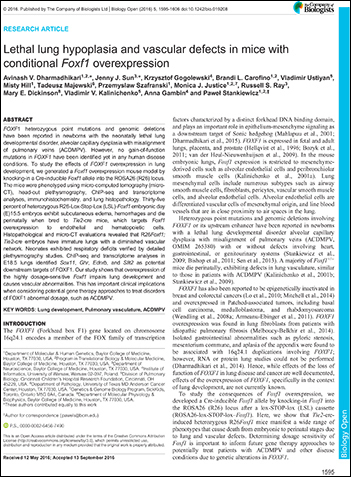 Dharmadhikari AV, Sun JJ, Gogolewski K, Carofino BL, Ustiyan V, Hill M, Majewski T, Szafranski P, Justice MJ, Ray RS, Dickinson ME, Kalinichenko VV, Gambin A, Stankiewicz P.
Lethal lung hypoplasia and vascular defects in mice with conditional Foxf1 overexpression. Biol Open. 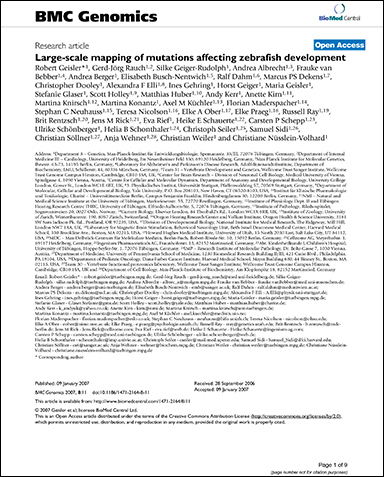 2016 Nov 15;5(11):1595-1606. doi: 10.1242/bio.019208. 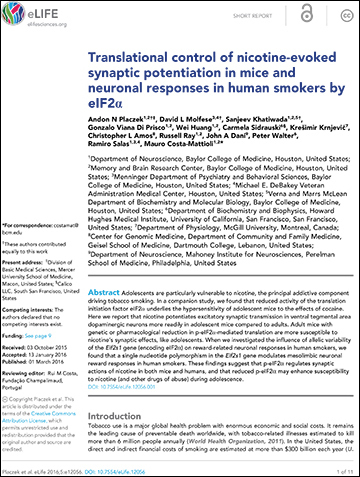 Placzek AN, Molfese DL, Khatiwada S, Viana Di Prisco G, Huang W, Sidrauski C, Krnjević K, Amos CL, Ray R, Dani JA, Walter P, Salas R, Costa-Mattioli M.
Translational control of nicotine-evoked synaptic potentiation in mice and neuronal responses in human smokers by eIF2α. Elife. 2016 Mar 1;5. pii: e12056. doi: 10.7554/eLife.12056. Teissier A, Chemiakine A, Inbar B, Bagchi S, Ray RS, Palmiter RD, Dymecki SM, Moore H, Ansorge MS. 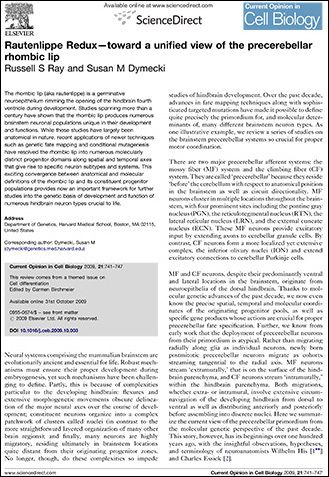 Cell Rep. 2015 Dec 1;13(9):1965-76. doi: 10.1016/j.celrep.2015.10.061. 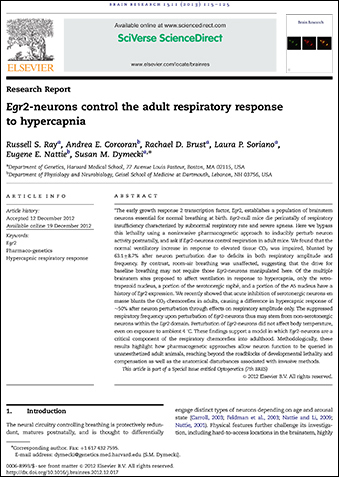 Egr2-neurons control the adult respiratory response to hypercapnia. Brain Research. 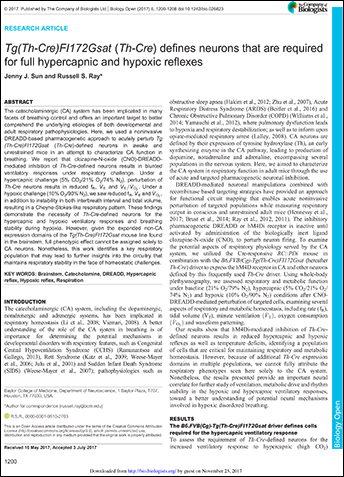 2012 Dec 19. doi:pii: S0006-8993(12)01907-5. Kong D, Tong Q, Ye C, Koda S, Fuller PM, Krashes MJ, Vong L, Ray RS, Olson DP, Lowell BB. 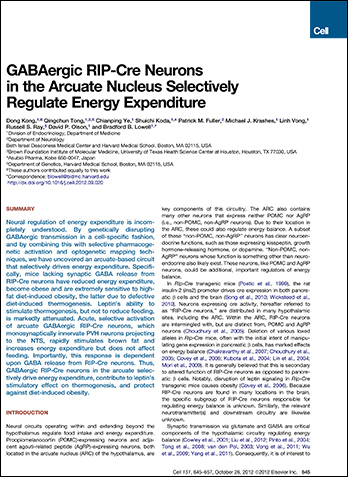 GABAergic RIP-Cre neurons in the arcuate nucleus selectively regulate energy expenditure. Cell. 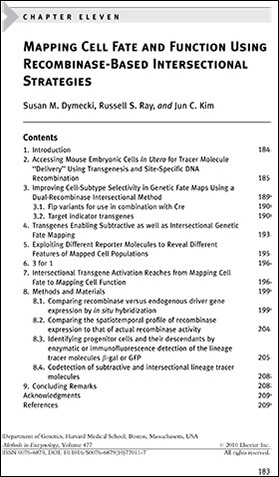 2012 Oct 26;151(3):645-57. doi: 10.1016/j.cell.2012.09.020. Ray RS, Corcoran AE, Brust RD, Kim JC, Richerson GB, Nattie E, Dymecki SM. 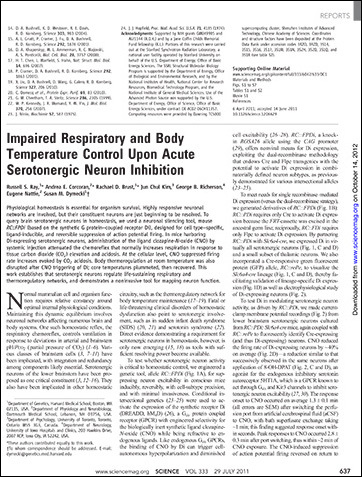 Impaired respiratory and body temperature control upon acute serotonergic neuron inhibition. Science. 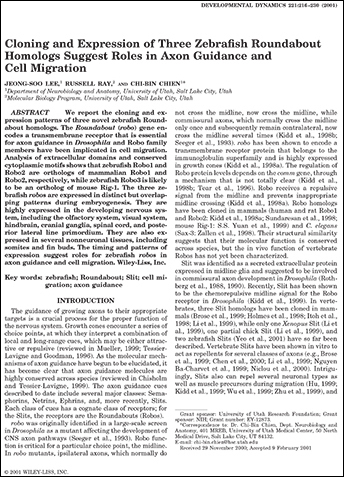 2011 Jul 29;333(6042):637-42. doi: 10.1126/science.1205295. Rautenlippe Redux — toward a unified view of the precerebellar rhombic lip. Curr Opin Cell Biol. 2009 Dec;21(6):741-7. doi: 10.1016/j.ceb.2009.10.003. Dymecki SM, Ray RS, Kim JC. Methods Enzymol. 2010;477:183-213. doi: 10.1016/S0076-6879(10)77011-7. 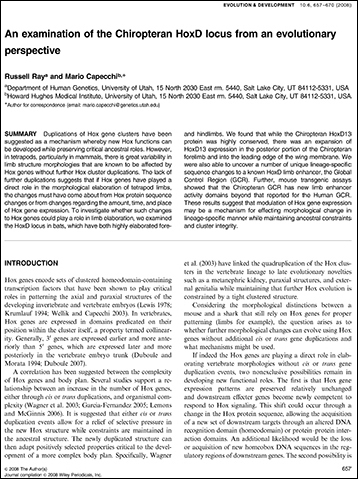 An examination of the Chiropteran HoxD locus from an evolutionary perspective. Geisler R, Rauch GJ, Geiger-Rudolph S, Albrecht A, van Bebber F, Berger A, Busch-Nentwich E, Dahm R, Dekens MP, Dooley C, Elli AF, Gehring I, Geiger H, Geisler M, Glaser S, Holley S, Huber M, Kerr A, Kirn A, Knirsch M, Konantz M, Küchler AM, Maderspacher F, Neuhauss SC, Nicolson T, Ober EA, Praeg E, Ray R, Rentzsch B, Rick JM, Rief E, Schauerte HE, Schepp CP, Schönberger U, Schonthaler HB, Seiler C, Sidi S, Söllner C, Wehner A, Weiler C, Nüsslein-Volhard C.
BMC Genomics. 2007 Jan 9;8:11. Lee JS, Ray R, Chien CB. Cloning and expression of three zebrafish roundabout homologs suggest roles in axon guidance and cell migration. 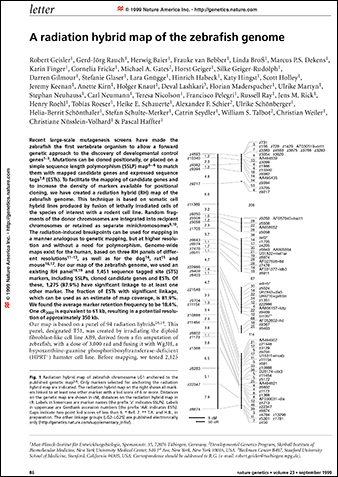 A radiation hybrid map of the zebrafish genome.